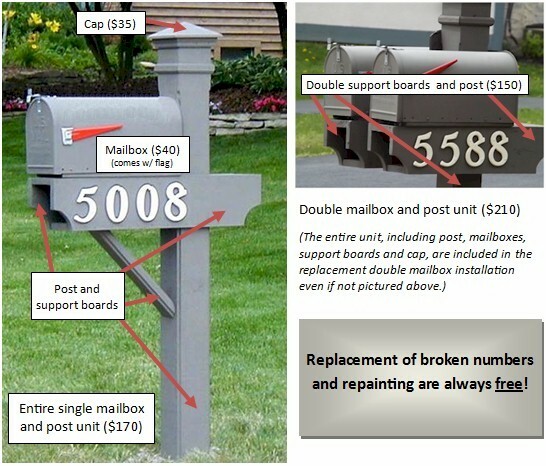 Request Mailbox Repairs - Muirfield Association, Inc. The majority of Muirfield properties use a mailbox unit specifically designed and built by the Association's maintenance staff. It is the responsibility of the owner to see that the mailbox is kept in good condition. To request repairs to your mailbox, please fill out the form below. In order for your request to be processed, you must include your name, street address, email address, phone number, and the repairs you are requesting. If your mailbox was damaged by the snowplow, please report damage to the City of Dublin at 614-410-4750 instead of using this form. The city will contact us and we will make the repairs. By submitting this form, you are agreeing to pay the charges indicated on this page. If the staff determines that different or additional repairs are necessary, the Association will contact you before proceeding. You will be invoiced after repairs have been completed. Confused about what you may need? See diagram below. If you have questions, please contact us. Some sub-associations feature cluster mailbox units or posts specific to that neighborhood. In those areas, owners should contact the sub-association's representative for assistance with maintenance. Please note: we are no longer able to replace only the flag on the mailbox. You are welcome to replace your own flag with any standard, red mailbox flag. (Decorative or speciality flags are not permitted.) We are still able to replace the entire mailbox, which comes with a flag, for $40. The Association is upgrading mailbox numbers with new, metal numbers by neighborhood. If you request new numbers, they will be replaced with plastic numbers until the mailbox refurbishment project gets to your street. Thank you for your order! Mailbox repairs will be made as soon as possible. Painting of mailboxes will be completed as weather permits.